Douglas County may have been burned by the cryptocurrency boom but it now wants to build a “blockchain innovation campus,” where researchers could develop new uses for the esoteric, computer-intensive technology—and, ideally, position this rural community for a share of industry when it arrives. Even as much of the world seems done with cryptocurrency, central Washington’s bitcoin boomtown is doubling down. In Douglas County, where easy access to cheap hydropower sparked a cryptocurrency boom in 2017 — followed by a collapse in 2018 — local officials are betting that the high-speed computers and the complex “blockchain” technology that drove those digital currencies could now launch another, less volatile industry. To accelerate that next phase, the county wants to build a “blockchain innovation campus,” where researchers could develop new uses for the esoteric, computer-intensive technology—and, ideally, position this rural community for a share of industry when it arrives. “There is more to the [cryptocurrency]story than the boom and the bust,” says Lisa Parks, executive director of the Port of Douglas County, which hopes to locate the campus on an old industrial site in the city of Rock Island, on the Columbia River. The blockchain was conceived as a tool to allow secure financial transactions without banks or other intermediaries. But the blockchain concept, in which transactions are processed and recorded on multiple computers across a decentralized network, can work for any data-rich interaction. Over the next decade, advocates say, blockchain will revolutionize everything from grocery supply lines to real estate contracts to self-driving cars. But launching that revolution will take an intensive research and development effort—one that Central Washington, with its cheap power and, thanks to the bitcoin boom, a huge pool of high-speed computing capacity and cryptocurrency expertise, is well-positioned to host. Douglas County’s proposed innovation campus idea is part of a broader effort by Central Washington to cope with aftermath of the cryptocurrency boom, which swept through Douglas, Chelan, and Grant counties beginning in 2014. The catalyst was cheap power, generated by the region’s five big hydroelectric dams. The trillions of computer calculations necessary to produce bitcoin and other cryptocurrencies consume massive amounts of electricity. Through 2017, as cryptocurrency prices soared (bitcoin went from $1,000 to nearly $20,000), cryptocurrency “miners” and investors from as far away as China requested thousands of megawatts of power from the three counties’ public utility districts. A megawatt is enough to power anywhere from 125 to 400 Central Washington homes, depending on time of year. By early 2018, a collapse in cryptocurrency prices took the air out of the Central Washington bitcoin boom. But well before then, residents and local officials had pushed back against the industry’s load on local power systems. Utility officials, concerned about committing so much power to an unproven, volatile industry, began to roll out a range of restrictions on miners. In Chelan and Grant counties, utilities officials eventually hiked the price of power for new miners. The new rates are so high, some industry players say, that they effectively have halted expansion of mining. In Grant County, for example, total power requests by prospective miners has fallen from around 1,500 megawatts as of last August to just 313.5 megawatts today, according to Grant PUD spokesman Ryan Holterhoff. But Douglas County has charted a different course. In addition to efforts to host a bold new blockchain industry, the county continues to encourage the old one—cryptocurrency mining. The Douglas County Public Utility District’s rate increase for new miners, for example, wasn’t nearly as sharp as in Chelan and Grant counties. As a result, while power requests have declined, Douglas County continues to see new mining operations. 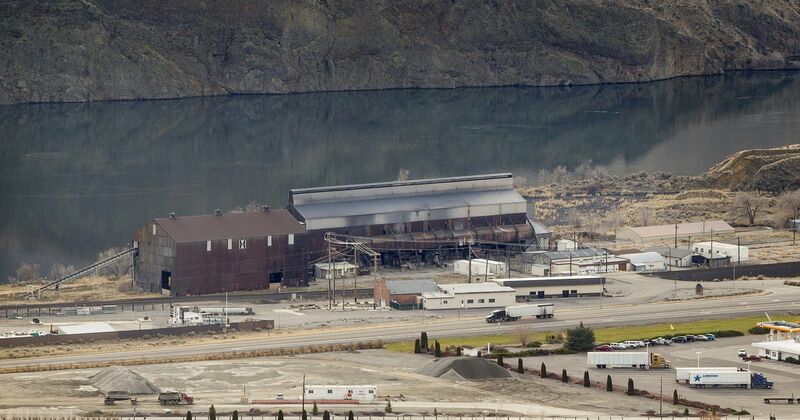 In November, Bitmain, a large Chinese-based cryptocurrency company, opened a $20 million mine in Douglas County near the town of East Wenatchee. The mine, which features around 8,000 individual computers housed in five warehouses, will use 12 megawatts of electricity, according to the utility, or enough to power anywhere from 1,500 to 4,800 homes. Douglas County is even trying to resuscitate a defunct mining operation that has become a local symbol of the bitcoin boom and bust. The failed venture, which was launched by cryptocurrency pioneer GigaWatt, stalled last year after the company ran into construction delays and other problems and declared bankruptcy. Since then, the Port of Douglas County, which owns the GigaWatt site, has been talking with several competing investor groups about plans to use the facilities for mining, but also for other applications, such as cloud-based data analytics and artificial intelligence, that can use the same kind of compact, high-speed speed computing. One of those investor groups, Texas-based Red Team Investments, also hopes to be involved in the innovation campus in nearby Rock Island. Douglas County’s continued embrace of cryptocurrency might seem like an overly risky move for a community that arguably has been burned by bitcoin. Gigawatt, for example, owed the Douglas County Public Utility District more than $310,000, according to its bankruptcy filing. The Port of Douglas County is on the hook for more than $50,000, Parks says. But Douglas County officials see their crypto-friendly stance as a way for this less-than-prosperous rural community to leverage its one big asset—cheap power—to create a high-wage, data-driven industry. Parks points to nearby Quincy, where the rise of massive data centers for Microsoft and other tech firms have brought not only jobs but a massive increase in sales and property taxes. Douglas County’s crypto-optimism is shared by the state Department of Commerce, which regards cryptocurrency mining as a potential way to diversify rural economies. The department’s manager for business development, Evan Wendlandt, called the new Bitmain mine “a big win” for the county. The state agency is also supporting the innovation campus with a $50,00 grant.